Where nature art poetry and sport blend, Villa Dei Rosmarini is located in Cecina, 3 km from Toscolano Maderno and Marina di Bogliaco. The sitting area is on two levels (dining and dining area) with a romantic corner fireplace and comfortable sofas, overlooking the large porch in the shadow of the big fig with lovely lake view and exclusive scenery on the neighboring Golf Bogliaco. Well equipped kitchen and outdoor BBQ. The master bedroom is on the first floor with exposed beams and stone bathroom overlooking the lake-view garden. The second master bedroom is on the ground floor with a bathroom. The third double bedroom is located in independent annex with private sitting room and additional 2 beds with bath for service. Wide stately entrance and parking suitable for any car, gate and garden lighting with remote control. Wi-Fi, satellite TV, and stereo available everywhere. For kitchen lovers 100 meters from the house you will find typical trattorias where you can enjoy the "Gardesani dishes" or grocery store. Wi-fi, satellite TV, stereo, safe, coffee machine, toaster, flatware, cutlery, cups, glasses, American placemats, pots x 12 people. Baby bed with toddler bed. The bathroom and 'available to guests of the outbuilding. Beautiful setting overlooking Lake Garda. Augusto, the owner was so friendly and helpful. Loved it. The property is set on a hillside overlooking a beautiful part of Lake Garda. It has every facility that any family require and Augusto the owner is so helpful and will do anything to ensure his clients are happy and satisfied. My wife and I and our two adult daughters and their husbands spent a week in Roina on Lake Garda this month (July 2017). We has a spectacular time. As you can see, the views from the patio are amazing. We really enjoyed spending our breakfasts and dinners with this view. The kitchen was fully equipped for both cooking and eating. The house was conveniently located to many sites around the Lake. It is convenient to several small, picturesque towns on the lake as well as convenient to great hiking. Our host, Augusto was amazing. He gave us many ideas for things to do in the area. Augusto also went above and beyond and took us out on the lake in his boat. It was one of the highlights of our trip. Most Americans, when they visit Italy, go to Rome, Florence and Venice, all great places, but I encourage you/us to visit other areas of Italy. Visiting Lake Garda was a lot of fun and showed us another sliver of Italy. And you can't go wrong with Augusto. He is very honest, reliable and a generous host. We had a great time and you will too. GRAZIE MILLE for your beautiful review! It was a pleasure to host such a lovely and friendly Family as yours! future , a great hug from Lake Garda! 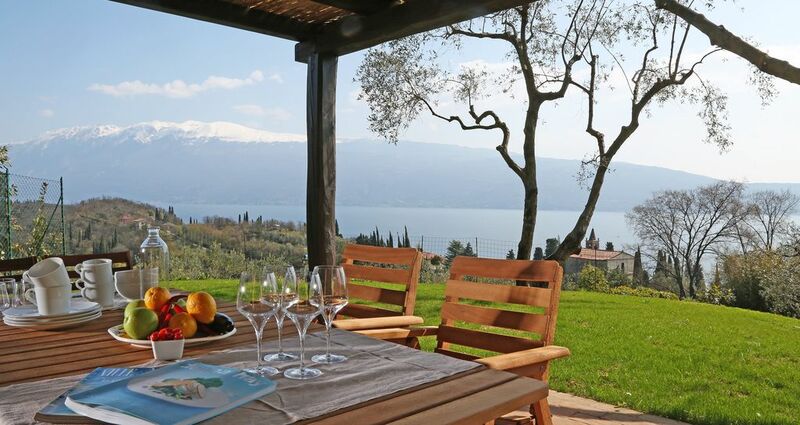 The Villa sits at a beautiful location at a hill side with an amazing view over Lake garda. The road to the villa while narrow was were drivable even with our full sized van. Augusto, the owner, was a very friendly and professional and made a us feel very welcome. The villa was clean well maintained and furnished with taste. Angefangen von der guten Betreuung von Augusto schon im Vorfeld, über die persönliche Begrüßung mit Tipps und Hilfsangeboten, bis hin zur Verabschiedung. Wir fühlten uns rundum wohl. Der Blick auf den See spricht für sich. Wir waren eine Woche in der Villa und haben es sehr genossen. Viel Ruhe und gutes Wetter haben uns Erholung geschenkt, die den oft hektischen Alltag vergessen lässt. Wir werden wiederkommen. Dear Monika&Stefan, Ilona and Johnny many thank’s for your nice review! I’m very happy you fell good & relax in the romantic “Villa dei Rosmarini” and I hope to see you soon. Warm regards from Garda Lake and I wish you all the best for the new year! De ligging en de mooie tuin met het prachtige uitzicht op het meer maken dit een heerlijke plek. De villa heeft een ruime ( op 2 niveaus) woonkamer, die goed is ingericht. De keuken is klein, maar voorzien van een afwasmachine. De masterbedroom ligt op de vide, staat dus in open verbinding met de woonkamer. Verder zijn er nog een slaapkamer en een aantal slaapplekken in een apart aangebouwd huisje. De bedden zijn van goede kwaliteit. De 3 badkamers zijn adequaat, maar kunnen wel een opknapbeurt gebruiken. Samenvattend : de locatie maakt dit huis speciaal. Wir haben das Haus in einem sehr guten Zustand vorgefunden und Augusto, der Hausbesitzer ist sehr zuvorkommend und freundlich. Wir wurden nett empfangen und waren rundum zufrieden. Das Haus liegt zwar recht hoch und die Straßen dahin sind sehr schmal, jedoch ist die Lage gut. Das Haus war ordentlich und sauber. Mit dem Auto ist alles zu erreichen und das Haus bietet genug Platz für größere Gruppen (8-9 Personen). Wir würden jederzeit wiederkommen! Golf, sailing, windsurfing, katesurf, boat rental, boats, car ferry, mountain biking, deltapano, paragliding, hiking and walking, theater, cinema, disco dancing, the Vittoriale museum, paper museum, churches, lemon-houses, restaurants, shops, beauty farm, banks and much more are just a few km from the Villa of your Rosmarini! a paradise for nature lovers, sports and good food.